If you need an extra screen you can use on the go then you have to check out this AOC Portable External Monitor. This is an external monitor you can use on your Mac or PC and one that is portable with a foldable stand and a protective case so that you can take it with you where ever you go. Now besides for your small laptop screen you can have an extra 16 inch monitor with you so that you can do your work a lot better all thanks to the screen. And this screen just has a USB connection (available as USB 3.0 and USB C) that even gives it the power to make it super easy to use. 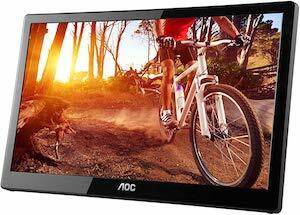 So get ready for more screen space by ordering your AOC Portable External Monitor.